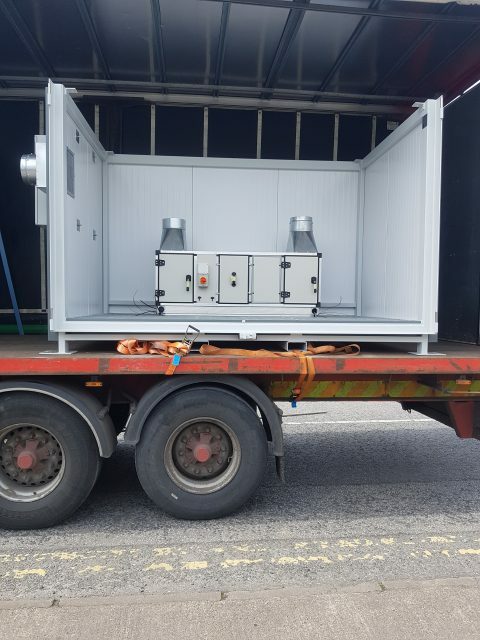 Mr. Donal O’Sullivan of GSK contacted Chemstore and outlined a project he was working on which required a temperature controlled unit. 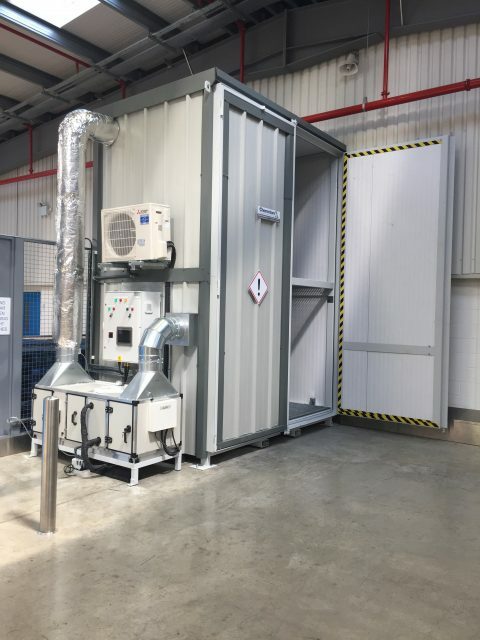 The project required an Insulated store for 4 pallets of product which is required to be stored at a temperature range of 10 and 25ºC and humidity control of less than 60% RH. The store was to be situated inside the loading area in the raw material stores. The pallets were 1650mm high and due to the height of the store and access limitations, the store had to be built in 2 sections on site. 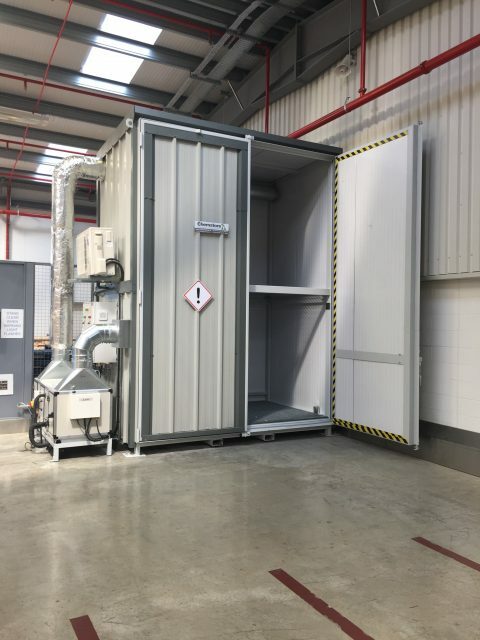 GSK recently engaged Chemstore to design, supply, install and commission a RH / Temperature Controlled Storage Unit for one of its raw materials. The performance of the Chemstore team was commendable in relation to design, safety, installation, quality & schedule. 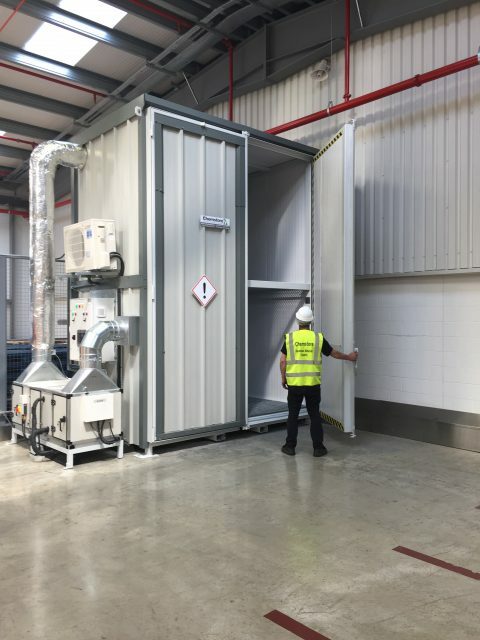 Their management & contractor’s were professional and experienced, they engaged seamlessly with GSK adopting an innovative, flexible, co-operative approach, delivering a first class installation safely to a tight schedule. We would have no hesitation working with or recommending Chemstore for future projects. Storage Capacity:4 pallets, 1,200 x 1,000 x 1,650H – mm, stored on 2 levels. Construction:Robust all welded 100 x 50mm steel box section frame. Sumps:1 No. steel sump trays fitted under lower shelf level. Total Capacity: 800L (exceeds current EPA guidelines, 25% of the total volume). Bund Test Certificates are also issued with each unit. Shelving: Galvanised grid decking fitted to both levels of the store. 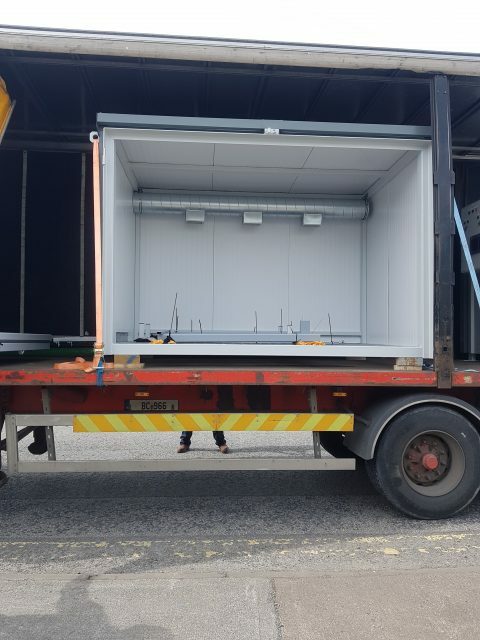 Lifting: Unit is fitted with forklift channels for easy unloading and relocation. Wall/Roof Cladding: The profiled, double skin insulated cladding is designed to reflect heat radiation and limit heat conduction through the paneling. Kingspan RW system incorporates 40mm insulation core with excellent thermal properties. The profiled, single skin cladding is fabricated from a Longlife Zintec based, corrosion-resistant alloy, then Plastisol coated. Standard colour: Goosewing Grey. Lifting: Unit is fitted with forklift channels to allow for easy unloading and relocation if required. Signage: Relevant safety signs fitted to BS499 on all units.